Sometimes looking at an old painting that you never really liked is a great opportunity to reinvent and start afresh without having to confront the scary blank canvas. I had this garden painting hanging on the wall for ages but had never really felt that it was finished or ‘resolved’ with its two clumsy white spots, an excuse for introducing some tonality to the blue meadow inspired imagery. So I took it into the shed and started to paint over it in warm contrasting colours to see what I could do to refresh and renew and make something beautiful out of something I had fallen out of love with. Sticking with the intuitive process that has dominated my art this year especially, I kept at it, adding colours and marks with varying tools to arrive at a stage where the original painting had not disappeared but provided a backdrop for some new exciting things to emerge and start happening. Slowly I began to see the outline of a face suggested in the marks and I worked with this. The meadow of the original painting was still there in essence so I started to think about how I could incorporate the two elements to create a figure immersed in landscape. The headdress morphed several times, at one point a bird was flying out of it, but I preferred the organic flowery, feathery, meadow suggestions and brought these kinds of imagery into sharper focus. I’m learning the power of tonal depth, something that my colourful offerings have lacked so much in the past. 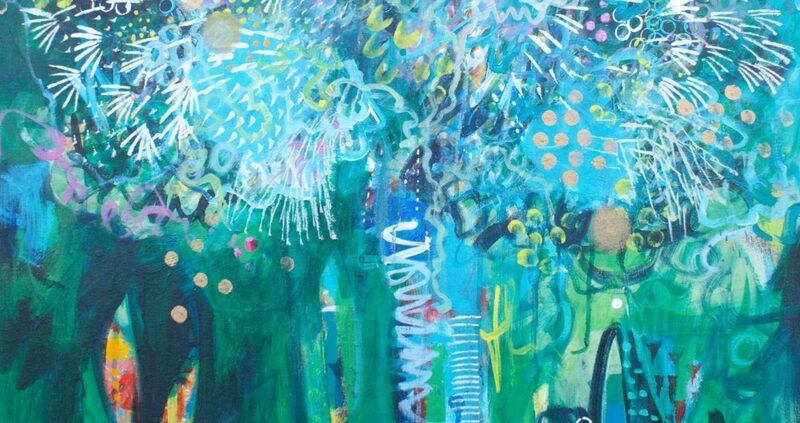 Flora Bowley showed me how what she calls value contrast adds to the overall cohesiveness of a painting. For this painting deepening the outline of the figure and introducing translucence to the dress has I think brought some tonal contrast to colour explosion that is her headdress. My subliminal inspiration for this painting is a vintage 1970s print bought in a charity shop, some photos that I took on a trip to Bali about 30 years ago and drawings of meadows in Branscombe. I love how different aspects of life and memory can impact on how a painting becomes what it is. There are also shades of inspiration from Girl with a pearl earring by Vermeer. I will be getting prints done of this painting for sale in my Etsy shop in the near future.